As the Librarian for South Asia at the Penn Libraries, I am responsible for collecting all intellectual and literary content about and from South Asia. This involves selecting information resources in over three dozen languages, across geographically and culturally diverse regions from Afghanistan to Myanmar, including Pakistan, India, Sri Lanka, Bangladesh, Bhutan, Nepal, Tibet, and the Maldives. The building of research collections has to balance short-term needs with a long-term vision. Of course, we need material that supports teaching and research of the faculty and students, but we cannot lose sight of material that might be increasingly relevant in the distant future. As members of various,resource-sharing networks we also have a responsibility to acquire content that is unique thereby adding greater breadth and depth to regional, national and international cooperative partnerships. While it is important to engage with academics who study societies and cultures, it is also important to have direct interaction with the peoples and societies themselves. Travel enhances an understanding of knowledge-generation in South Asia, and also how the ‘authentic’ sources of that knowledge are produced. It is not always the content alone that makes a book valuable. Very often, as books get older, and we are distanced in time from the production of the item, the material artifact itself is of scholarly value, for all the social and economic values of knowledge production that the physical object itself embodies. 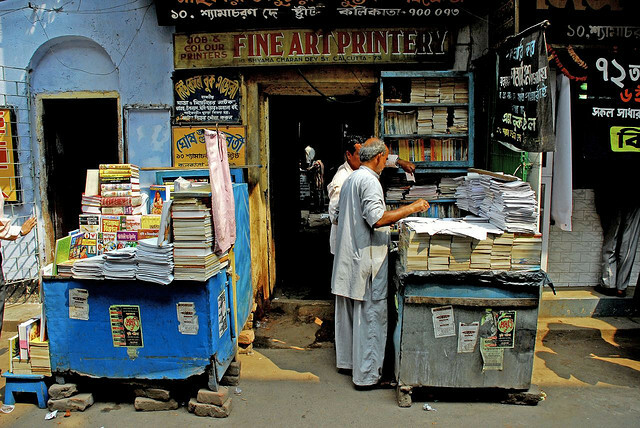 Fine Art Printery, College Street, Kolkata. Photo by Akshay Mahajan (June 2005). It is in this context that travel allows for many kinds of acquisitions that are not ordinarily possible. They range from the obscure and rare material unavailable through regular channels to occasional serendipitous discoveries. The great variety of material acquired in the field is unified only by its relative unavailability elsewhere. Institutions (both public and private) such as the Tamil Nadu State Archaeological Department, the History Museum of the Marathwada University, the Museum and Archaeological Department of Madhya Pradesh, or the Asiatic Society of Mumbai, have no mechanisms by which to distribute and sell their publications. As a result, hardly any research library outside India ever receives these books, and they need to be proactively acquired. 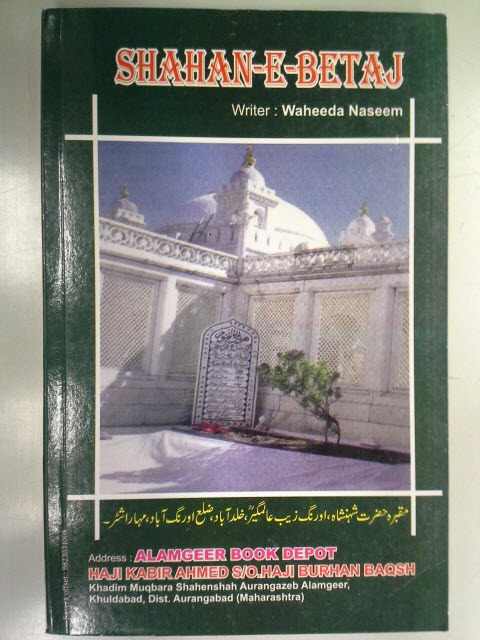 This is an example of a book published and written in a city and region not associated with Urdu. Most vendors do not think of collecting language publications in areas not traditionally associated with the language (e.g., Urdu books authored and published in Pune) As a result, such material is routinely missed by most large libraries. A locally popular guide to visiting the Sahyadris is not to be found in any library in WorldCat, except for one copy in Australia. Yet, the book has become the standard for travelers to the Western Ghats. Similarly two recent books on the forts of the Konkan region are not listed in any other library in WorldCat. The Penn Libraries did not acquire the first item below through our normal Library of Congress Field Office sources in the early 1990s. It subsequently went out of print but I was fortunate to locate unsold stock. The second book is a primary source document now out of print, which no other library has acquired. This book is meant to be sold only to professional architects licensed by the Council of Architecture in India (they check your professional registration number!). It cannot be ordered or sold otherwise. I was in New Delhi for a couple of days, and happened to visit the offices of the Council of Architecture. Needless to say, I did purchase the book and added it to the collections of the Penn Libraries. While traveling through the Deccan, in cities such as Aurangabad, Daulatabad, Khuldabad and Jalna, I came across are a set of local histories written in Urdu about places in the region. Such books are truly hard to come by, as the publication firms are very small with almost no distribution channels. Such local histories in vernacular languages provide an invaluable corpus of material for the historian, but the publishers also do not imagine a market larger than local consumption. Hence, such titles are available only in and around the places that they describe. None of these books except Gulistan-i Khuldabad and Tarikh-i Aurangabad (both held by the Library of Congress only) are available anywhere in the United States. I was surprised to find a copy in Delhi of a state-sponsored scholarly publication from Iran about the medieval town of Tabas, and immediately purchased it for the Penn Libraries. Yaʻqūb Dānishdūst, Ṭabas shahrī kih būd: Banāhā-yi tārīkhī-yi Ṭabas, Tihrān: Sāzmān-i Mīrās̲-i Farhangī-i Kishvar; Intishārāt-i Surūsh, 1997. [Only copies with Penn, Princeton, New York Public Library, New York University, Metropolitan Museum of New York, and Columbia]. To summarize, there is no substitute for collection trips, to meet authors, scholars, publishers, printers, vendors, and other agencies that are important filters in determining the titles offered to our libraries, and those that are not. The Library of Congress, along with several vendors and collectors who offer us lists, profiles, and approval plans, act as mediators and have already weeded out a large volume of material. The selectiveness of these agents is shaped by their own institutional interests, and, in large part, by their capacity to travel and comprehend the scholarly requirements of research institutions in North America. Instead of relying solely on the judgment of vendors and agents who are not internal participants in the intellectual life of the university, collection trips allow an unfiltered and unmediated access to the sites of knowledge production, thus enriching library collections. This is beneficial not only for our short-term goals, but also for long-term strategies, and not just as a single institution or regional consortium, but as a national resource.